Experience the friendly, casual atmosphere of the 45 passenger Kawartha Voyageur riverboat. Meet new people and relax as our able crew take care of your every need from the minute you arrive to the minute you leave. Community, Relaxation, Cleanliness & Value. Meet new friends on a Canadian river cruise and explore Ontario’s magnificent heritage waterways. We invite you to take time to unwind on our peaceful riverboat as an ever-changing panorama of scenic lakes, rivers and locks slowly pass before your eyes; the perfect backdrop to whatever you choose to do onboard. We provide hassle-free, peaceful and inspiring cruises on three of Ontario’s finest waterways. Take a look at what we offer and please feel free to contact us with any questions you might have. Enjoy the website and we hope to meet you soon – our crew are waiting to welcome you aboard! 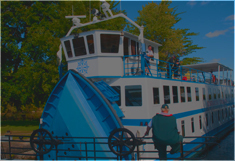 While aboard the Kawartha Voyageur, you will enjoy a comfortable, clean and safe environment as well as a selection of traditional meals, carefully prepared, cooked and served to you by our friendly and polite staff. The Rideau Canal offers a time capsule of quiet history as it was on completion in 1832. Of the 35 locks we travel through, all but 3 are constructed of hand-cut stone and are manually operated by the lock staff. Designated as a UNESCO World Heritage Site in 2007. The granite shores of the Rideau lakes area are particularly beautiful. 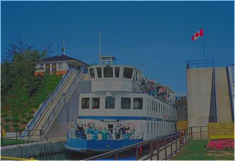 The Kawartha Cruises navigate a 240 km (150 mile) section of the Trent-Severn Waterway to the north-west of Peterborough. These cruises travel the Kawartha Lakes and the Severn River. 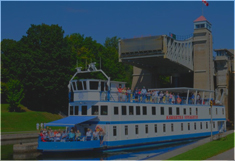 The Trent-Severn Waterway is one of Canada’s national historic sites and is so magnificent it has been named "one of the finest interconnected systems of navigation in the world"
The Quinte cruises offer a magnificent combination of our other two cruises. On the southern portion of the Trent-Severn Waterway between Peterborough and Trenton, there are 19 locks including the large flight locks at Healey Falls and Ranney Falls. Traveling through the Bay of Quinte, we reach the incredible beauty of the Thousand Islands in the St. Lawrence River. The Kawartha Voyageur will commence our 2019 cruise season on May 12, 2019. Our crew will be reporting to the ship for training on April 29. The US/CDN exchange rate continues to be very favourable for our friends from the United States. The current cost of our 2019 cruises including tax is $US 1,740. (subject to change according to the exchange rate when your final balance is paid). You may view our 2019 cruise schedule by clicking Cruise Dates on the menu at the top of this page. For specific information and rates on our Rideau, Quinte or Kawartha cruises, please click CRUISES on the menu above then select one of the three cruise routes. All cruises in any given year are the same price. We are currently 94% booked for 2019. There is still a selection of 2019 cruise dates that are currently available at this time. However, once a particular cruise is fully booked, a wait list is set up for that cruise date. We do get 2 or 3 cancellations per cruise and there is no obligation to place your name on the wait list for as many cruise dates as you like. If your name comes up on a given cruise date, we will give you a call. If the date doesn't suit when we call, we simply call the next person on the wait list for that particular cruise. 2018 was our 37th season cruising the historic waterways of Ontario. The Trent-Severn Waterway and the World Heritage Rideau Canal have been operating since 1833. The Trent-Severn Waterway was not fully open to thru navigation until 1920. Both waterways are part of Canada's National Parks and are open from mid-May to mid-October. Whether it be your first or a return, we look forward to welcoming you aboard the Kawartha Voyageur for a refreshing and memorable voyage.